You are likely reading this via your e-mail or online via the World Wide Web. You may also access your bank accounts and credit cards as well as Amazon, PayPal, etc. via the internet. Many of you post to Facebook, Twitter, LinkedIn or Pinterest to name a few. If you have digital pictures or you back up your smartphones, this is all done online. You may even store important data files online at sites such as Carbonite. For many of us, more and more of our lives take place in an online, digital world. Our digital “footprint” grows larger all the time whether we realize it or not. But what happens to all of this when you are gone? How do your heirs access your important files and accounts? What kind of value does this have? Should this all be preserved or disposed? In today’s world, your online legacy can really become a tangled web. Nearly 90% of consumers own multiple digital devices, with 62% owning 3 or more and 20% owning 5 or more. More than half of consumers (51%) spend 15 hours or more on their digital devices for personal use each week. More than 2 hours a day! On average, we have over $35,000 worth of assets stored on our devices consisting of video games, books, music, photos, apps, etc. Traditional estate planning very rarely gets into this topic and most people don’t consider the immortality of our digital footprint. However, with the online world becoming such a big part of many or our lives, we need to plan for this along with everything else in our estate. Experts say it is now essential to include provisions in your wills and powers of attorney outlining how to access and dispose, of digital assets such as photos, e-mails and online presence on sites such as Facebook and LinkedIn. If you conduct virtually all of your transactions online, it might be hard for your executor to find all of your accounts, assets and outstanding bills. Survivors need to be able to access online accounts and e-mail and will need to know which sites you frequented, along with the user names and passwords to gain access to these sites. This information is being referred to as a “Cyber Will”. 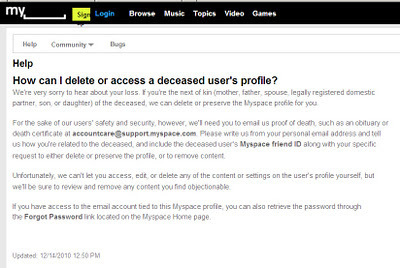 A “Cyber Will” identifies an online executor whose responsibility it is to access and shut down a decedent’s social media, e-mail, blogs, online accounts, etc. This “Cyber Will” is not really a legal instrument but provides the instructions, user names and passwords to family and friends for dealing with your online accounts. The goal is to ensure that the deceased’s online assets can be accessed and that the content is handled in accordance with the wishes of that person. 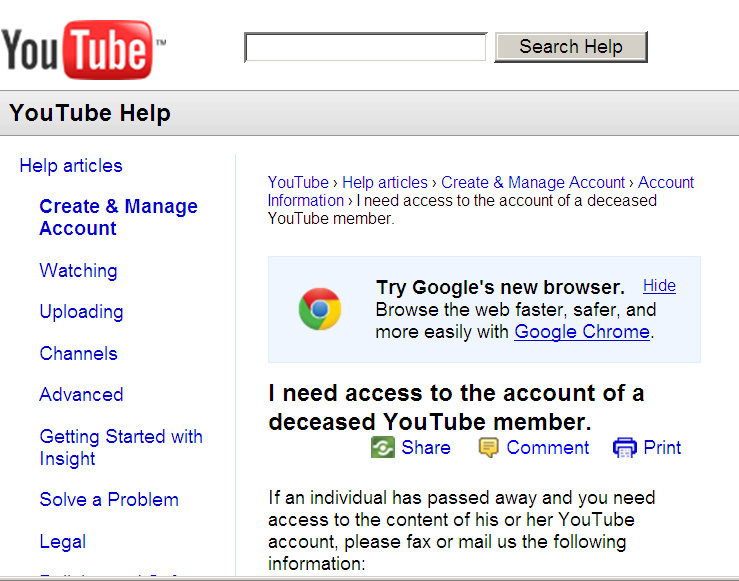 Documenting how to access accounts is extremely important. Without a username or password, it can take months or longer to access accounts and many large firms are reluctant to grant access to anyone other than the original user. (Password management sounds like a great idea for a future article) This information can be written and shared with the attorney, executor or other family members, or kept in a safe deposit box. One place you DO NOT want to put it, though, is in your will. Since a will is a public document, you DO NOT want this information included where everyone can see it. 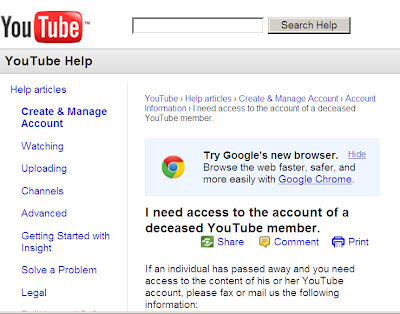 Digital assets such as music and books that reside online are usually not allowed to be passed from the deceased to their heirs. Most commercial sites such as Apple, Amazon, Yahoo, etc. only allow the license to these items to exist with the person who bought it. Since everyone reads all the lines in those “Terms of Service Agreements” before clicking “Accept” we all know this already. This purchased content from iTunes and places like Amazon’s Kindle is fiercely protected by these companies as individuals buying media online are not granted actual ownership but are leasing the materials for the rest of their lives. There are some companies that have sprung up in the last few years to take advantage of the demand for online estate planning. They are considered digital estate management services and provide ways for storing passwords and providing instructions to loved ones on how to deal with their online assets. They may also offer services that destroy the online content that the person would like to have destroyed after their death. Legacy Locker (now known as PasswordBox) and SecureSafe are two of the more recognizable companies providing these services. These companies are also password management providers which provide ways to manage your growing password collection. There are also smartphone apps such as “Deathswitch”, “My Last Wish”, and “If I Die” that allow the departed to let loved ones know about their final wishes and to send a message to loved ones after they are gone. These apps aren’t so much used for conveying user names and passwords, but more for leaving messages and instructions for survivors. 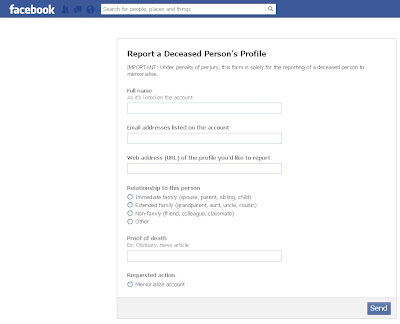 Getting back to Facebook accounts, nearly 400,000 Facebook users die each year, so Facebook now provides options for loved ones to either close accounts or memorialize the departed. 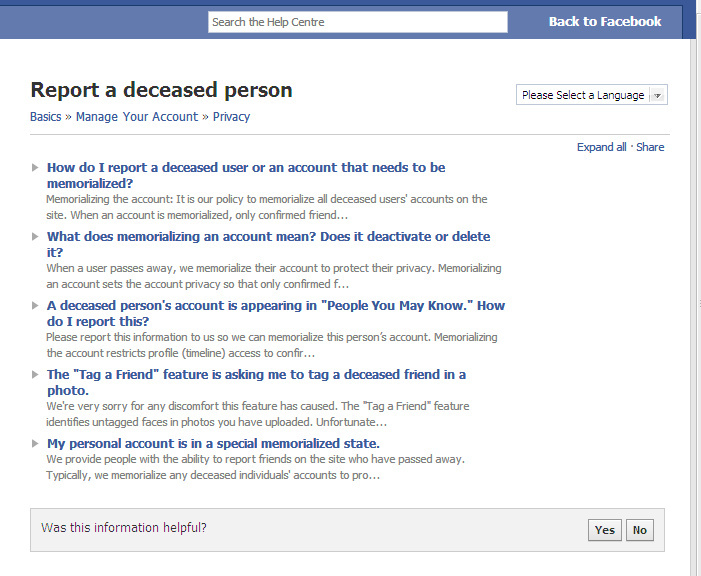 Memorialized accounts can only be accessed by confirmed friends and family and they can leave messages in remembrance. 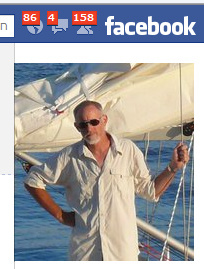 The accounts can be left open indefinitely. As you are preparing your estate plan or the next time you are updating your estate documents, it would be a good idea to discuss the concept of a “Cyber will” with your attorney. You should consider including provisions in your wills, powers of attorney, and revocable living trusts that authorize your executors access to your online accounts. 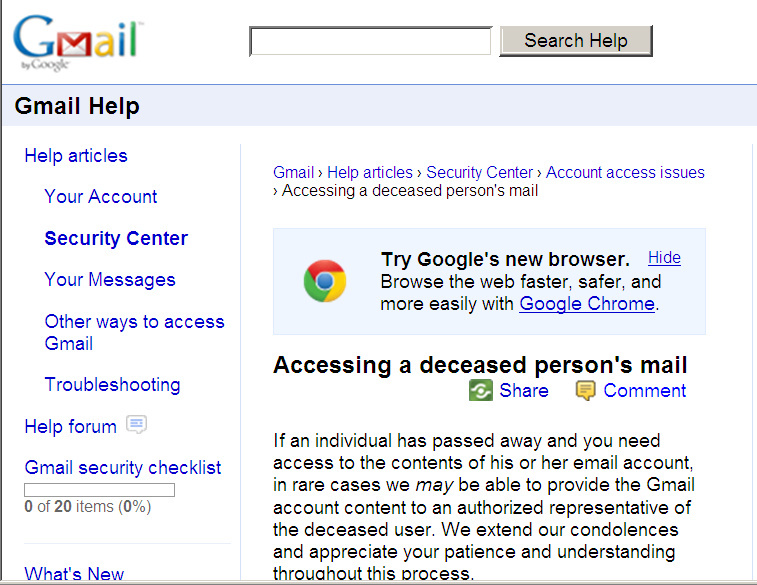 Or you may want to consider one of the services such as PasswordBox or SecureSafe to help with this. It can save your heirs many hours of toil and trouble and help ensure that your valuable digital assets aren’t just locked in cyberspace forever without access by your loved ones. 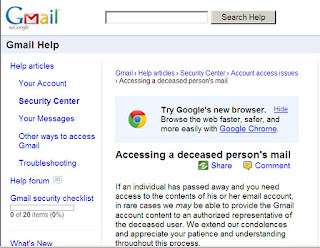 Presented at SXSW 2009 at the core conversation “Who Will Check My Email After I Die?” The general process that we recommend is to list your assets, define your wishes, choose someone to execute your wishes, and provide access and control to that person. Consider creating a spread sheet that lists your assets, defines your wishes, and contains access to those accounts. 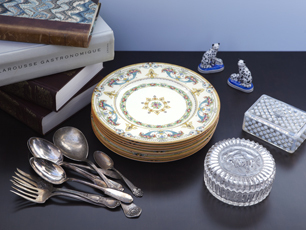 The List Your Assets section will discuss your digital possessions: photographs, videos, writing, and intellectual property that you want distributed after your death. The Define Your Wishes section will talk about how to specify what happens to your assets upon your death. 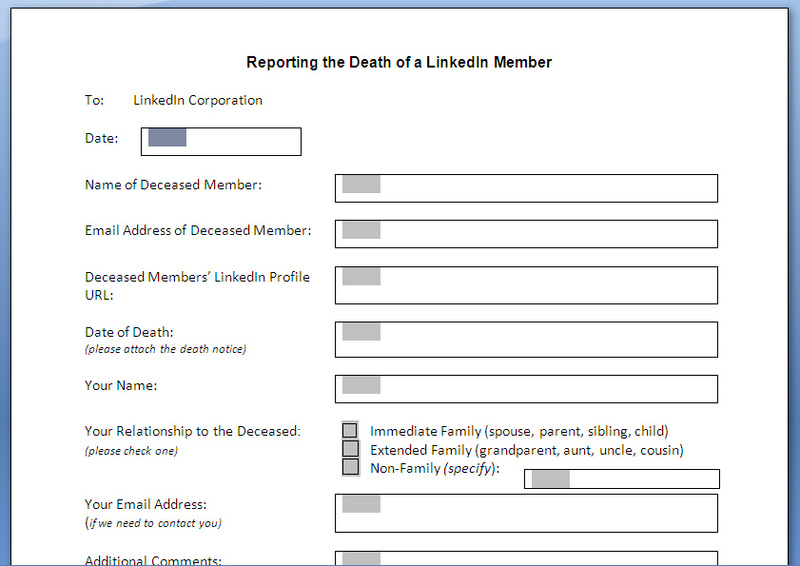 The Choose a Digital Executor section will talk about how to choose someone to help execute your wishes. The Grant Access section will talk about making sure that the people that survive you will be able to access digital accounts and services. Finally the Services section contains a list of services that can help you. Note: This is not intended to be a legally binding document. It is intended to be guides to help you better prepare yourself and your loved ones in the event of your death. Laws that govern digital assets are in their infancy. What you need to know now is that data is governed many different ways and control and “ownership” of that content changes from state to state and from service to service. Currently control over your content is largely a matter of access and the terms of service. Many of us are creating a body of online content that will outlive us. Some of it will be valuable to your family and friends for either personal or monetary reasons. Some of it may be interesting to the people that will consider you their ancestor. Some of it will be complete rubbish. One of the main challenges with managing your online content is the very notion of “ownership” itself. Additionally, there needs to be a separation between the communication medium and the content. You don’t own the email address (since the domain is only leased), but you DO own the content of your emails. Many online assets are already governed by a “Terms of Service” (TOS). Content such as music may be strictly governed by Digital Rights agreements. Content uploaded into photo, video and social sites will likely be governed by a TOS. Blogs may or may not be governed. We suggest that you read the terms of service at each site and service that you use. Commercial services that store your content need to be considered. Domain names are leased, not owned, and will be lost unless renewed. Hosting is a paid-for service that terminates after prepayment ends, often with the deletion of all data. Once you have defined what your assets are, you need to define what you want to do with each asset after your death. Archive it? Delete it? Give it to someone specific? 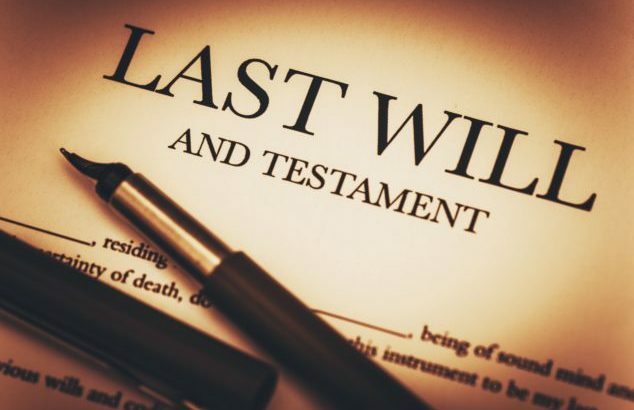 While estate law varies from place to place, our culture seems to consider a person’s will as the definitive place where you define what happens to your assets after you die. We recommend that you discuss these assets with your lawyer when you are creating or modifying your will. Permanently archiving data is something that is still difficult to do. Expect to see services that offer this in the future, but currently there is nothing that we have found to do this. Also, list content that you do not want archived and explicitly state that you want it deleted. 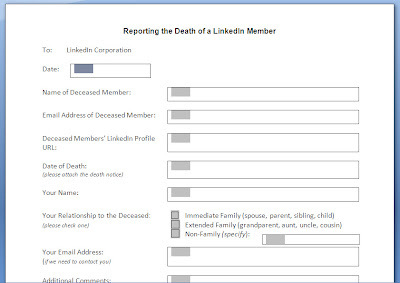 You may benefit from naming someone your “digital executor.” This is especially important if you are responsible for the digital technology for other people (parents, spouses, children) who are less technically savvy. The myriad of accounts, usernames, emails, and passwords can complicate your survivors lives and shut down their connectivity and ability to communicate on the Web. Even though the law does not recognize and formalize this position, it may be helpful to name someone and have them agree to help your dependents untangle the assets during the transition following your death. This person can also go through your asset list and execute your wishes, archiving, closing accounts, and deleting data as your wishes state. Access to online accounts and services is of critical importance to each of us and our families. Unfortunately there are no formal or universal laws that govern online data. What we do know is that access provides control. 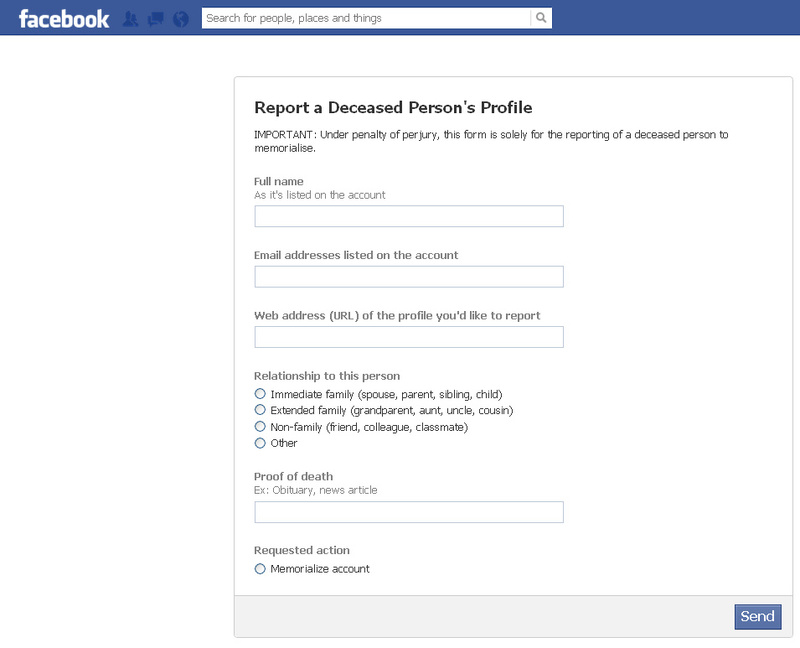 If a trusted person has access to your Facebook account after your death, then they can control what happens to the account. Also, a lot of content that you may consider to be yours is actually “owned” by the service or network that you post it on. 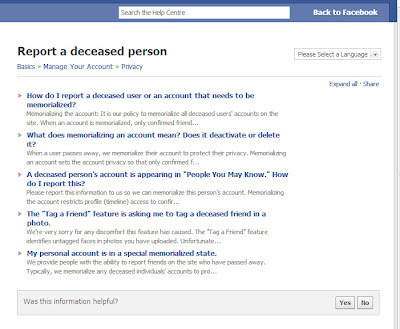 Be aware that your content may be deleted once the host organization learns of your death. 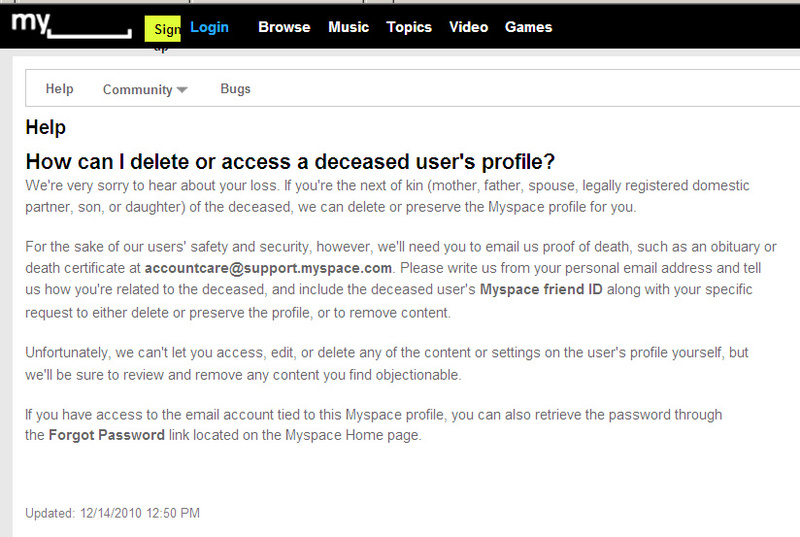 If you want the content archived after your death, you may need to give someone full access to the account. Your legal will is a public document and is therefore not an appropriate place to store access to your online accounts and services. Additionally, laws concerning access to digital accounts vary from state to state. 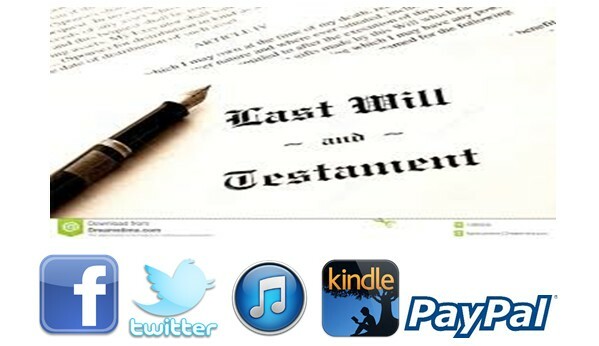 Some states do not recognize digital assets as part of a will. This forces us to find mechanisms that will give our survivors the access and control they need. There are several approaches that you can take and several services that you can pay for to help with this issue. The approaches range from lo-fi to high tech, but whichever you choose, you must make sure that the basics are covered. Many online services link to offline elements in your life. Bill pay services may keep your electric bill paid and your lights on. Mortgages are often paid for online. Make sure to specify the account number of these services so that your lights stay on and the bills get paid.